I don’t normally recommend that people go to McDonald’s for anything beyond their bathrooms, but I would like to go against my normal impulses and will put in a plug for visiting the famed food pusher. 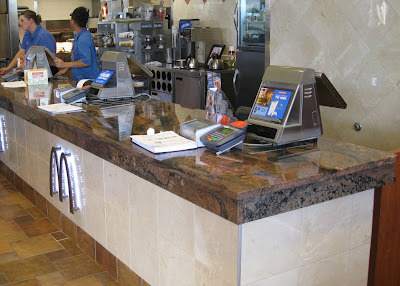 Of course, I am not suggesting that one go eat; instead, go for the geology, for at the McDonald’s in Redwood Falls, Minnesota, the counters are made of Morton Gneiss, a stone that I have previously noted as the oldest, commonly used building stone in world. The gneiss is 3.5-billion-years old and the quarries are about seven miles from Redwood Falls, in Morton. I like to think that the employees are very proud and quite aware of the famous stone that graces their work place. Wouldn’t you be that way? No matter what, I would like to give a word of praise to McDonald’s and whoever designed this building. They didn’t have to honor the local geology and history but they did. Nice work on the gneiss! Later this week, I will follow up with some additional observations about the Morton Gneiss and its use in Art Deco architecture. The following shots are used courtesy of Jonathan Moore, who is a master’s degree candidate in the College of Design at the University of Minnesota. I think I may have been to that McDonald's – to use the bathroom on a field trip to the Morton Gniess. It's great fun to see the rock we've been discussing, even during a break! Enjoyed the story. Treasure in unexpected places. Is there any placard or the like posted there to tell customers about the wonderful stone before them? At least, their minds would be fed with some healthy info. Thanks for the comments. Tony, that's a good question. I have no idea. I will see what I can find out. 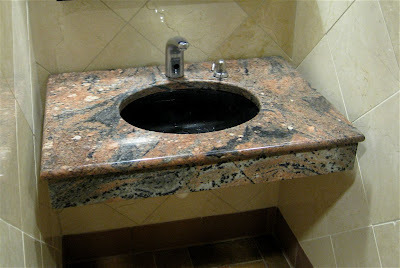 I know,I know, you've seen one granite, you've seen 'em all. But still, that granite in the Frostbite Falls McDoonalds looks strangely familiar ! I saw some like it in a condo on Williams Way (no relation). Gneiss, very nice. drove through redwood falls after visiting morton, the gneiss and the quarry. love the stone. so sorry we drove right by THIS macdonalds. Previous Previous post: Sand: Michael Welland Responds!